Rice, veg, salmon... a fairly well balanced tasty meal. You know, sometimes inspiration comes from the strangest places. This dinner came from three. Dealing with the remainder of a bulk purchase: I was looking for something to do with the last pieces of “value pack” salmon I recently purchased. For those who may not know, “value pack” refers to buying in larger quantity at a lower price, not that the salmon was discounted… Kind of sounds like a racket when you read it, doesn’t it? Buy less, pay more. Why can’t it all be the same lower price? Larder happenstance: As I looked in my cupboard my eye spied a bag of dried limes that I recently bought at a Middle Eastern grocery. I had promised myself I would use them more regularly. Dried limes are exactly as they sound – desiccated limes. Little brown balls. And they’re fantastic. Dried limes are typically used in Arabic and Persian cooking. They impart a wonderful citrusy taste in whatever recipe they're used. That taste would go fantastically well with salmon. Required errand: I was on a mission to the local Asian grocery. I was low on several staples, one of which was rice wine vinegar. I’m still dealing with all my blueberries. I had decided to make blueberry tarragon vinegar and my recipe needed rice wine vinegar as an ingredient. 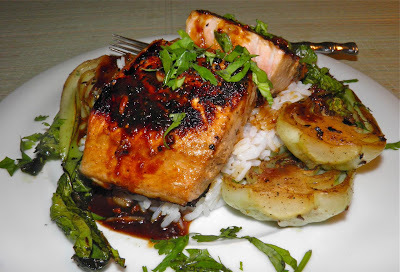 Salmon is quite delicious when cooked with Asian favours and I already had to go to the local Asian grocery. So I did as the Grinch, and I "puzzled and puzzled ‘til [my] puzzler was sore." I also Googled a few recipes posted by others for Asian Salmon to make sure I was on the right track. Out from the other end came this meal. Topping up my list with a couple additional needs, I toddled off to the Ca Hoa grocery. This dinner turned out really well. The flavours are very nice and the balance is just right. Main flavours? Salmon, dried lime and rice wine vinegar, just as I hoped. They’re great together! You can accomplish all three dishes simultaneously with a little planning. Marinate the salmon ahead of time, then about 25 minutes before dinnertime start the rice. The rest just falls into place. In a medium flat baking dish, whisk together 2 tbsp sesame oil, the rice wine vinegar, soy sauce, molasses, garlic, pepper and onion powder. Nestle the salmon, skin side up, into the marinade making sure it is well coated. Cover with plastic wrap and marinate on the counter for 1 hour. Remove from the marinade and fry in a little sesame oil, skin side down first, then flip and finish cooking through. Total for each side should be about 4 minutes for 1” thickness. Remove the salmon and let sit while you fry the bok choy. While the salmon is frying, simmer the marinade in a saucepan to cook and reduce slightly. It will thicken up quickly. Add a little more rice wine to thin it. This also boosts the flavour. Poke several holes in the lime with a fork to allow the water to access the interior. Place the water in a sauce pan with some salt and the dried lime. Bring to a boil, add the rice and stir. Cover and reduce the heat to simmer. Let cook for 15 minutes, depending on the directions on the rice you are using. Let sit five minutes. Sprinkle the bok choy with five spice powder, salt and pepper. Add a little more oil to the pan and sauté the chopped hot pepper for 1 minute. Then add the bok choy, cut side down, and fry until the pieces start to brown slightly – about 3 minutes. Turn and brown on the other side. To serve, place some rice down the centre of each plate. 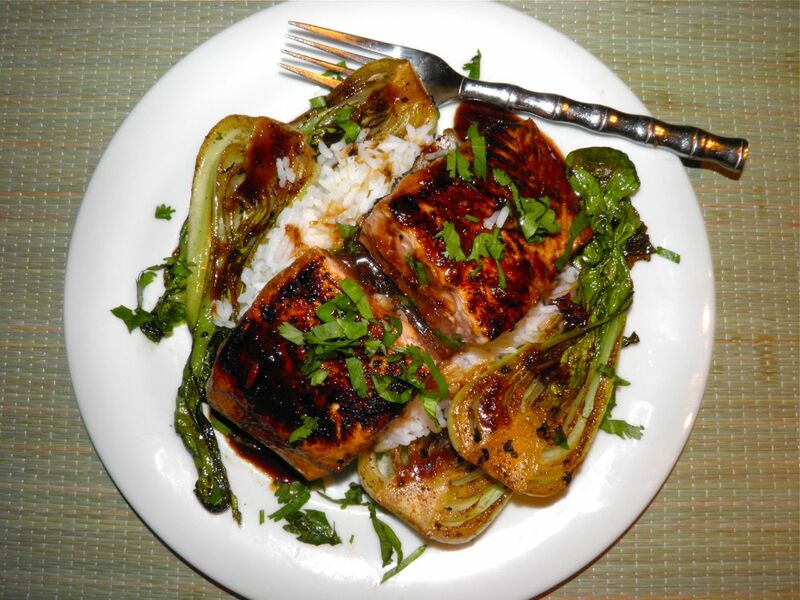 Arrange 4 bok choy halves per person per person on each side of the rice, and top with the salmon. Drizzle with the reduced marinade and sprinkle with cilantro.